People in Sheffield who are suffering from hair loss have good news because now they can undergo any surgical procedure such as FUT hair transplant in any specialized clinic. FUT is a surgical procedure that is more invasive than FUE. However, the procedure takes less time to complete and recovers fast. Follicular Unit Transplantation is the basis of hair restoration mechanism. This technique has allowed the surgeons to extract hair follicles in the form of strip that outdated the process of punch grafting. The manner in which the follicles are extracted and implanted, the transplant is also known as strip harvesting as it use the hair strip instead of individual follicular units. Therefore, it can be said that FUT is an older form of implantation that produces a natural look to your hair. Who is eligible for FUT hair transplant? What is the procedure of FUT hair transplant? Who should not opt for FUT hair transplant? If a person suffers from Trichotillomania that is a psychological disorder in which a people pull out their own frequently or suffers from undiagnosed hair fall then he/she should not opt for FUT. Apart from it, people below 24 years of age or have medical conditions, hypertensions, diabetes or heart problems are not suitable candidate for this treatment. After FUT hair transplant patients are able to get dense and natural looking hair. With this treatment a surgeon can also combine other treatment such as scar revision as per the need. Men who suffer from hair loss and feel frustrated when such issues proceed further even after medications should opt for FUT hair transplant that provides a long lasting and affordable solution. These days, both men and women suffer from baldness and in order to conceal they look for options. Women suffer from hair loss problems due to various issues such as hormonal imbalance, stress, etc. While there are many temporary solution to get rid of this issues, the most permanent solution to treat hair loss in women is FUT hair transplant. Do not take alcohol, cigarette aspirin, vitamins, arthritis and blood thinning medications 3 days after the procedure. If you are from Sheffield and suffering from hair loss then not to worry at all as there are many reputed clinics that provide both surgical as well as non-surgical hair loss procedures. Nu Hair Clinic is one such clinic that offers FUT hair transplant and other treatments as well. Nu Hair Clinic is equipped with every modern technology required to treat hair loss and have fully qualified doctors who have years of expertise in dealing with all kinds of hair loss. Hair loss can become a very serious issue if not treated properly. 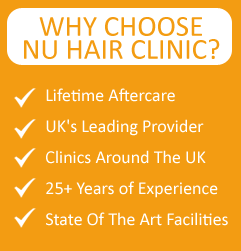 Nu Hair Clinic is considered to be one of the best clinics in Sheffield because we provide different types of surgical as well as non-surgical treatments to treat hair loss. Our patients are our top priority and this is why we take care of our patients even after the procedure to ensure that they take proper medications and precautions. Every result is important to us therefore, before surgery we provide free consultation to see what procedure works best for you.